Whats More Exciting than a Boat? For two years Ben and I have been looking for a vessel for our next adventure. Now that we finally purchased a boat, many people are eager to know what type of boat it is. What is more exciting than the boat, is what we plan to do with it. During the same two years while we were on a mission to find a boat, we were also on a mission to create an opportunity that brought together our best skills and interests. Our work with One Simple Question is complete, and the film is passed on to the motion graphic artists and musicians to add the icing and wrap it up for release. Now we are on to our next project, Ocean Courier. Ocean Courier is a docu-series about conservation efforts worldwide, from the floating studio of a Norseman 447. Each episode is connected by a tale of a seagoing adventure. We feel today’s audience is more apt to connect with people, personal growth, and a spirit of adventure than the doom and gloom that is common in conservation media. The Ocean Courier audience is propelled from one conservation initiative to the next, learning about the ocean with us, while also experiencing the thrills and hardships of life at sea. 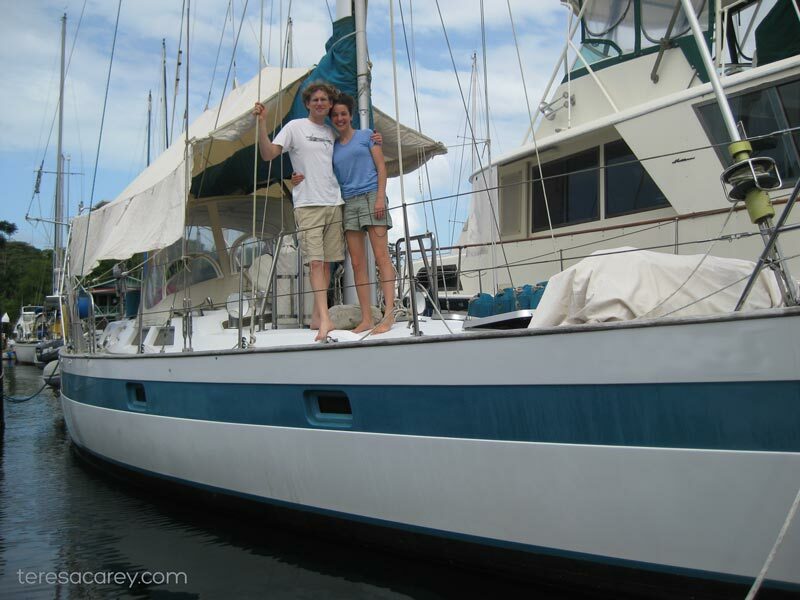 For our pilot episode, we are sailing to Armila in Guna Yala, Panama. Armila is a very remote, indigenous village with only 600 people. It is home to one of the largest nesting sea turtle populations in the world. The reason the turtles thrive there is because the local people have a strong, almost spiritual connection with the turtles. However, new modern ways of life, are threatening their traditional ways of doing things, and therefore the health of the sea turtle population. We will sail there to meet up with Morisson Mast and Amanda Gibson who are working with the locals to expand their conservation efforts. With cameras and real engagement, we plan to highlight the connection between the traditional culture of the indigenous people, their music, and the health of the sea turtle population in the hopes of telling a heartfelt story of conservation, connection, and joy. Its easy to read my blog and watch my vids and see someone cruising around, free as a bird, and enjoying the ocean. But I’m constantly working on jobs that don’t pay in addition to the necessity of taking jobs that do pay. The past few months have been a whirlwind of activity: buying a boat, moving to a foriegn country, doing deliveries, writing articles, becoming a project of The Ocean Foundation, a 501c3, pitching our docu-series, getting lots of rejections, trying to raise funds for our pilot episode, getting lots of rejections, etc. Its been non-stop from dawn until dusk. Its times like these that I wish I had a good ol’ 9-5! Its true what they say..the water is always bluer on the other side! Please visit our website. Take a look around. Let me know what you think! We are looking for a production assistant in Panama from March 12 to April 1 (dates somewhat flexible). The opportunity is for students or anyone with experience or interest in film. If you are interested, send me a resume and letter. By the way! For those of you who were wondering why I’m calling it “Guna Yala” and not “Kuna Yala” it is because they changed the name in 2011. Its officially Guna Yala now. Congrats! I discovered your blogs and videos a couple of years ago. Glad to read the adventure continues and looking forward to more posts! Safe sailing with the new boat. Congratulations on the new boat! I am so excited for the two of you and as always, amazed at your energy and motivation to make a difference. God speed the two of you as you continue your journey.I am so proud to know and love you! The picture above says it all – Ben is NOT sporting a beard. Congratulations! I look forward to your future post of your adventures. Beautiful Boat!! She should serve you well on your upcoming endeavors and future adventures. Got to love a Robert Perry designed boat, we enjoy our Baba 35. Ahoy There Mate’s ,,,, sooo glad you both are in agreement on the new boat you chose to comit your lives too . That choice may come with ample rewards , guess it is up to you to sort it out . Your passion and hard work have paid off once again. Great concept. We look forward to following your latest project. I wish you and Ben great success in your venture and adventure with your new boat. Looking forward to watching your films. Congratulations! So glad you got a Perry boat, they’re some of the best out there. Sounds like life has been busy, but when you guys have a spare, precious moment I think all of us would LOVE to see some photos of your new girl. Pretty please? With halyards on top? Good luck in your new adventures! Wow – what a beauty you guys! Congrats on the new boat and the next chapter of your adventures together. We wish you all the best and hope you’ll come and visit if you ever find yourself in the Bellingham, WA area. Did I miss it? What kind of boat did you buy? Good luck with the new yacht and continuing sailing adventures! Chase those dreams because they don’t come looking for you! Sailing simplicity on 45 footer? How things changed in few years :-)…. It is actually only 44ft 7in, so I think we make the cut! I have always maintained that my exploration of simplicity is just that..an exploration. And yes, simplicity still guides us. In all the literature by the great simplicity thinkers of the past: The Nearings, Thoreau, Gandahi, Elgin, etc.never did I see a size measurement for simplicity. Never have I come to understand that simplicity must equate to small. Its much more layered than that, and I cannot live by arbitrary rules. People grow and change. Even Thoreau left his cabin in the woods after only two years. Even The Nearings built a big home on the coast in Maine. But the values of simplicity still guided them, as they guided me in this decision. My husband and I want to continue to do what we love and do best, and what enriches our lives and others: teach sailing and make conservation films. We cannot do that aboard a 27ft sailboat. Where would our guests sleep? We considered even a 60ft boat. We could carry more passengers on a 60 footer! But our goal is quality instruction and an intimate experience for the passengers over being able to have more people aboard and therefore make more money. A 44ft 7in boat is a nice size for us and our goals: bit enough for passengers, small enough to still solo sail at times. Don’t worry, we are simplifying. The boat came with a TV, DVD player, microwave and some other stuff that we’ve already given away because they don’t enrich our lives. I think he was only kidding. In any case, there’s no need for you to justify yourself. You have your own philosophy and you’re sharing it with others. A lot of people, myself included, agree with you on it. Congrats on the boat. She looks gorgeous. Love what you are trying to do, we are following with great interest. The quest for adventure, the color of sea and the simplicity in beauty is most wonderful. I can easily understand what you might be feeling. All the best with the adventurous ride, Good luck!